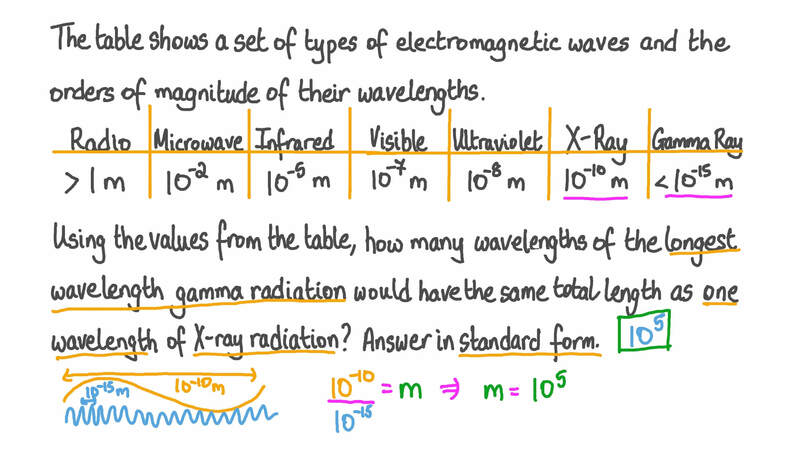 In this lesson, we will learn how to analyze the electromagnetic spectrum by identifying and describing types of electromagnetic radiation and their sources. What is the name of the type of electromagnetic radiation that has the longest wavelengths? The table shows a set of types of electromagnetic waves and the orders of magnitude of their wavelengths. Using the values from the table, how many wavelengths of ultraviolet radiation would have the same total length as one wavelength of infrared radiation? Answer in standard form. Using the values from the table, how many wavelengths of the longest wavelength gamma radiation would have the same total length as one wavelength of X-ray radiation? Answer in standard form. Which of the following could be a source of X-ray radiation? BNone of the answers is correct. Which of the following could be a source of infrared radiation? Which of the following could be a source of radio waves? What is the name of the type of electromagnetic radiation that has the lowest frequencies? What is the name of the type of electromagnetic radiation that has the shortest wavelengths? What is the name of the type of electromagnetic radiation that has the highest frequencies? Which of the following types of waves is a part of the electromagnetic spectrum? 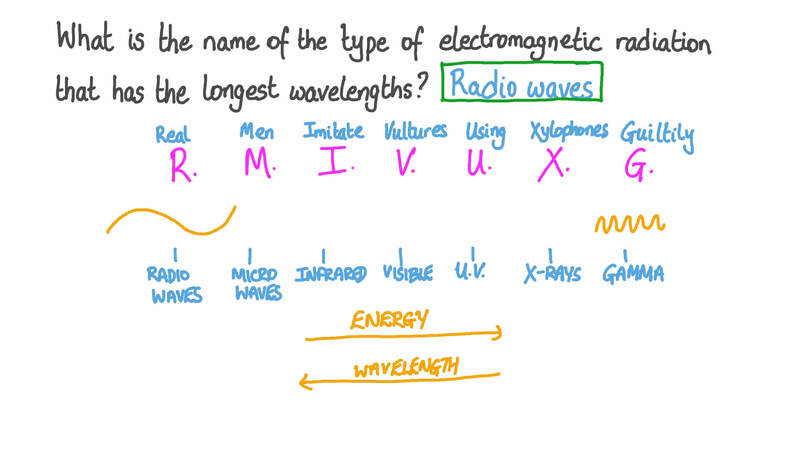 Which of the following types of waves are not a part of the electromagnetic spectrum?